Dengue Fever is one of the most concerning emerging infectious diseases of the early 21st century. The virus has been spreading with its ever-expanding host, the mosquito Aedes aegypti. For the last several years there have been naturally acquired cases of dengue fever in the United States and Europe, that are not connected to travel. Aedes aegypti‘s preference for the urban environment distinguishes it from most mosquitoes. It prefers to lay it eggs in small urban pools of water – flower pots, old tires, car ruts, buckets – rather than natural forest pools. As day-light feeders, bed netting would not be useful against A. aegpyti. It has been known for some time that A. aegypti populations are driven by super-producing sites, pools of water that produce the majority of mosquitoes vs. pools that only produce a very few pupae. It is known that dengue fever is transmitted by super-spreading events but it is unclear how this is tied to A. aegytpi super-production sites and other factors in the environment. 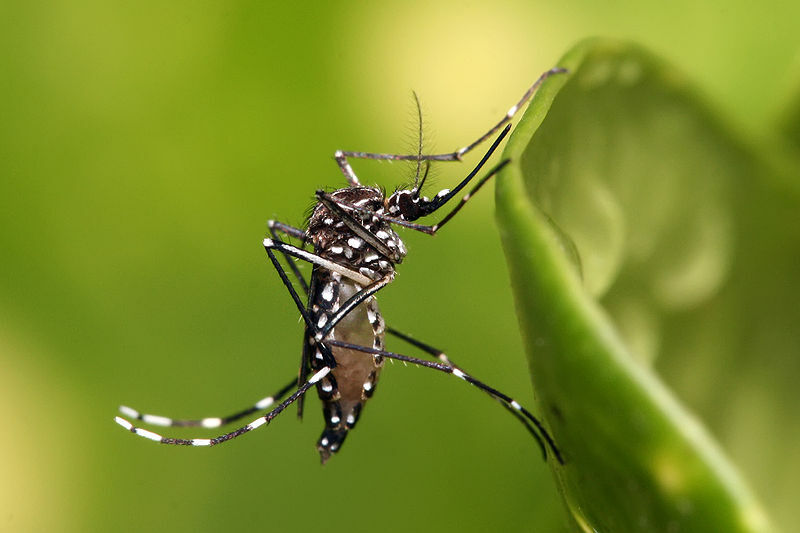 To study this phenomena a group of researchers from Yale School of Public Health and the Institiuto National de Salud in Bogota, Columbia chose a dengue fever endemic neighborhood to study the major parameters in transmission. They identified three primary parameters to monitor. Density of humans domiciled in the plots who can be infected. Padmanabha et al devised a new index they call the epidemic potential, secondary infection rate (Ro) per capita. They hypothesize that human density alters the epidemic potential by altering the dengue viral introduction rate and the secondary infection rate. Padmanabha et al. note that viral transfer from human to mosquito depends on the number of mosquito bites per person, while viral transmission to humans from mosquitoes depends on the number of different people an infected mosquito bites. They selected 16 similar urban plots in an endemic neighborhood in Columbia with a range of 41 to 142 homes (1-3 city blocks) with a human density of 3.2 to 4.5 residents per house. They surveyed A. aegypti pupae in water containers to estimate mosquito production and trapped mosquitoes to look for infected adults. Humans immune response to dengue virus was also surveyed over the season. The mosquito surveys were conducted seven times and human immune surveys three times over the season. They excluded schools, churches and other civil locations were the community gathers from the plots. Mosquito density results demonstrated super-production sites in each of the seven surveys within each patch. Only 5% of the house surveys accounted for 92% of the total mosquito pupae found. Pupal abundance accounted for nearly 80% of the variation in vector production. Their model predicted an Ro of 0.88 to 3.87 and correlated with the number of infected humans introductions that produced 20 or more secondary infections; this is only 10% of model repetitions. In most cases introduced viruses to the patch did not produce secondary infections. Analysis of human-to-mosquito transmission (viral introduction to the patch) and mosquito-to-human transmissions (secondary infections) suggest that both human density and vector abundance alter the dengue Ro and epidemic potential. Models using data generated by this study showed that the intersection of human density and vectors per household produced the best estimates of epidemic potential (Ro per capita). Padmandabha et al noted that “when viral introduction is accounted for, human density amplified the effect of A. aegypti super-production on dengue risk”. As they monitored the community over the summer with seven surveys they were able to see the decline in super-production decrease the epidemic potential in areas of highest human density. These super-productive habitats (at the level of individual homes) are seen here to be critical in producing super spreading events of dengue fever. All of the parameters for what makes a super productive habitat including human behavior have not yet been fully explored. This study looked at residential areas with the same socio-economic status. This team is planning further studies that look at a range of socio-economic communities and incorporate community centers like schools and markets. Studies like this one will be useful for designing strategies to target insecticide programs and other efforts to reduce mosquito abundance and dengue risk. On Giant’s Shoulders #66: Contagious History!